Fight as your ancestors once did to create your own myths and legends! Darklands is a tabletop skirmish wargame in which YOU command the hosts of man and beast that your ancestors once did for glory, power or simple survival. Fight breathtaking battles on your tabletop with some of the most finest resin miniatures ever created! What if dragons really flew, in those ancient times, and giants really walked the earth? What if berserkers actually were bear-men, man and bear joined together? What if all of the myths and legends we take for granted were real and our ancestors fought against - and with - creatures and beings and realms we thought were nothing more than the fantasies of our uncivilised selves? 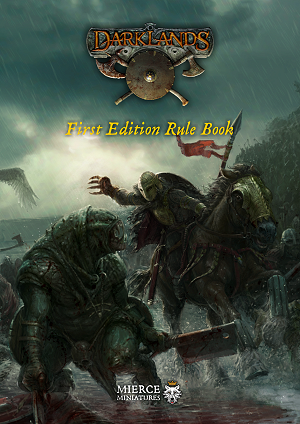 Darklands answers all of those questions for you and more, so take a deep breath and re-create the true history of our world with the Darklands: First Edition Rules found within this 364 page hardback book!